Manufacturer of a wide range of products which include jumbo 90 briquetting machine, jumbo 90 briquetting plant, jumbo90 briquetting press machine and jumbo 90 briquetting press. Our modern technological briquetting machines called Jumbo 90 Briquetting Machine used to create high density fuel briquettes from the loose biomass waste only with high pressure. The jumbo 90 briquette machine provides high performance without requirement of any binding materials. The huge quantity production of the biomass briquettes with less cost is the latest feature of the jumbo 90 briquetting machine. Radhe Group Rajkot - Jumbo 90 Briquetting Plant having the awesome features like high production capacity and minimum labor efforts, used to convert all kind of biomass waste into the bio coal briquettes. Jumbo 90 briquette press machine is used to make solid briquettes from the compression of the green waste like rice husk, cotton waste, groundnut shells, cumin waste, jute waste, sawdust, etc. without need of binding agent. Radhe Group Rajkot is the leading manufacturer in the field of biomass briquette plant since 1991. Jumbo 90 is our own invention in the world of briquetting and it is launched by us in 1997. Radhe Group Rajkot is the leading manufacturer in the field of biomass briquette plant since 1991. 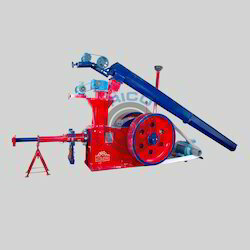 Jumbo 90 Briquetting Press is our own invention in the world of briquetting and it is launched by us in 1997. Supply the latest technological Jumbo 90 Briquetting Press over the entire world.